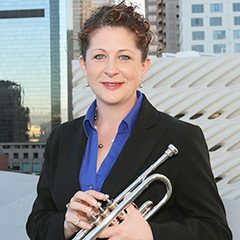 Jennifer Marotta is an adjunct assistant professor of trumpet performance at the USC Thornton School of Music. An active freelance musician based in Los Angeles, she regularly performs with the Los Angeles Philharmonic, San Francisco Symphony, San Diego Symphony, Los Angeles Opera, Los Angeles Chamber Orchestra, L.A. Master Chorale, and the St. Louis Symphony. Marotta is currently a member of the Grand Teton Music Festival and the Music of the Baroque in Chicago. She was a member of “The President’s Own” United States Marine Band from 2001–2005. Marotta was a visiting trumpet professor at UCLA in 2016, and was assistant professor of trumpet at Kennesaw State University from 2006-2012. She was also a visiting professor at Illinois State University in 2006, and was an artist-in-residence at Emory University from 2006–2010.